Report states around 200 childr­en lost their lives in drone campai­gns. 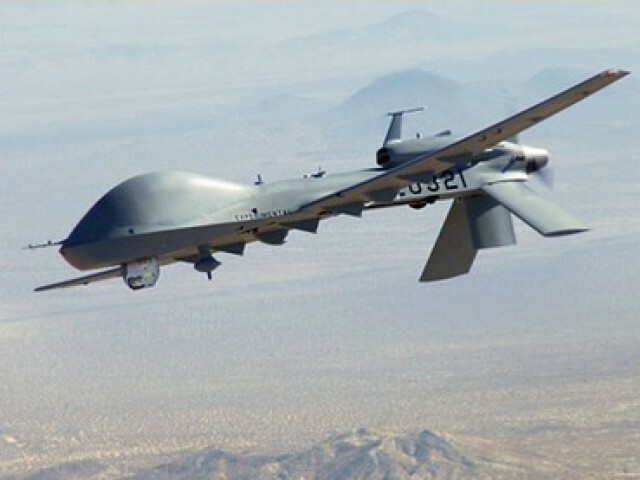 The number of reported civilian deaths caused by the CIA’s drone campaign in Pakistan is at an all-time low, a report by The Bureau of Investigative Journalism (TBIJ) stated. According to the data mentioned in the report, the number of drone strikes conducted under Obama’s administration stands at 318, while the total number of strikes carried out since 2004 is 370. These hundreds of strikes in Pakistan’s tribal region killed at least 2,500 people, 400 of whom are said to be civilians. The report stated that around 200 children lost their lives in drone attacks. The campaign carried out with the help of unmanned aircraft left around 1,100 injured. There is said to be a steep decline in the number of US drone strikes in Pakistan; strikes are now at their lowest level since early 2008. The average number of people being killed in each drone strike has fallen sharply too, an analysis of the Bureau’s data shows. On average, four people now die in each attack – just a third of the rate in the first six months of 2010. TJIB data indicates that the highest casualties in the US drone war occur when the CIA carries out “signature strikes” – attacking groups of men judged to be behaving in a suspicious manner. TBIJ is a not for profit organisation based at City University in London. Prosecutors say they don't consider the German as a civilian but a militant involved in an armed conflict. Resolution on drone strikes deferred after a ‘crucial’ clause on impeding NATO supplies was struck off. Drone fired two missile on a compound in the Mangroti village of Tehsil Shawal of North Wazirstan Agency. Drone attacks were illegal and it is a clear violation of the laws of United Nations (UN), says Shireen Mazari. The drone strikes are at historical low yet the attacks within Pakistan by the medieval murderous thugs are at historical highs ! The biggest myth that has been fed to this nation has been that drones are causing the incessant bombings and maimings of our citizens by the taliban gang. But why would ghairat-brigade let facts come in the way of a good US-bashing story !! SUCCESS!!!! Not killing as many (or perhaps enough) of our people any more. Thank you. so what they were just Pakistani kids who had no moral rights to live in this world. the world would have witnessed world war 3 if these kids had US nationality. Now the seculars would rush to justify US’s drones and even defending Necon’s NWO policy neglecting the fact that it is against International law and Human Rights, Inferiority complex at its peak! No need to kill civilians through drone strikes. Our own people are doing this job with BOMB BLASTS……….!!!!!!! Drone are as worse as TTP bombing…What wrong is wrong…END NEVER JUSTIFIES THE MEANS…. Will the American people accept 200 American children dead an all-time low? This is the double standard that makes the world hate Americans. Drone are as worse as TTP bombing…What wrong is wrong…END NEVER JUSTIFIES THE MEANS. ET MODERATOR I HOPE U WILL PUBLISH IT…..
For the righteous right, the blood of these 2500 maniac murderers is thicker than the 40,000 Pakistanis slaughtered mercilessly by them. @khan: Islam Will Conquer the world Again. Could you please enlighten us with a history lesson, When was the last time Islam ruled all of humanity? Second war was started by Al Qaeda whose leader was found in Abbottabad. May be its time to adjust the dose. Seems like PMLN is trying to create a justification for future attacks. How would journalists based in London know this, when the foreigners are not allowed in the areas we are talking about. Perhaps the reason for a reduction in deaths is due to the fact that many people run for cover every time they hear a drone. I recall that the British had an air raid warning system for the people during WWII. It is a pity that Pakistan does not introduce a similair system. If they had done so several years ago perhaps a few hundred children would still be alive. This the same Bureau who’s reporters have never step foot in either Warziristan and who’s statistics are gathered by Google searching any article that covers drone attacks? The most imp difference between drone attacks and TTP attacks is that drones target known terrorists while TTP specifically target Pakistani citizens. In drone attacks mostly known terrorists die who live among local population. In all terrorist attacks innocent Pakistanis die including old, young, women, and minorities are targeted. Drones do not target schools, little girls, shrines, hospitals and public busses which are favorite targets of TTP and their allies. You wouldn’t be writing this comment, had your own kid been among those 200 children killed in the drone strikes. It only shows how insensitive you are towards those innocents who lost their lives for no crime. By saying this, in no way I intend to support what TTP is doing. In my opinion, majority of them is being manipulated by the strategic coalition of evil forces (CIA+RAW) using drone strikes to provide them reasons for their existence at one hand, and by providing cash, arms, and logistics on the other hand to carry out their misguided (through their stooges in TTP) terrorism against the state and people of Pakistan. By stopping the drone strikes, TTP will lose the reasons, if any at all, for their existence, and would be exposed if they further carry out their activities. You sure aren’t a Pakistani. @Lala Gee: I am somewhat lost in understanding your logic. Are you saying that RAW and CIA first prop up TTP with cash and arms and than they monitor them and at the right time use drone to kill them without any regards for collateral damage? Also according Mush drones are part of secret agreement between government of Pakistan and US and most of the ground intelligence for drone attack comes from Pakistani sources? Alternate explanation is that ground intelligence provided by the Pakistani sources was faulty and collateral damage was high and now it is better that is why damage is low. A typical ghairat brigade/pti/zaid hamid follower’s response! Don’t worry Harish, i have been there. LOL! @HR, if our guardians in khaki had been doing their jobs, neither there would be any need for drone strikes nor there would be mayhem created by TTP thugs, aka your ‘misguided’ brothers. And you wouldn’t be writing your rants, had your own kid been among the 40,000 Pakistanis slaughtered by the maniac criminals operating under the name of TTP, or had he been used as a weapon to blow up the mosques, schools, hospitals, parks, shrines. @It Is (still) Economy Stupid: Understanding logic. I also used to have trouble with logic, but from different sources; notably US logic. However, I am getting on top of it now. For example, the US/UK/Zion combo and their vassal cronies have been going around the world for the last twelve years bombing and killing people on the flimsiest excuses, and I wondered why. Well Lala Gee is on the ball although to a logical person it may not appear so. The aforesaid combo have a divide and conquer plan. It is devilish and cruel, but it serves their purpose, which is hegemony . The combo does not care who gets killed, including their own, as long as tactical and strategic objectives are met in the long run. I did say earlier over the last twelve years, but British brutality has been ongoing for hundreds of years and now they are working with overwhelming US power to continue achieving their goals. The East India Company used to control the Sub-Continent, and then India and Pakistan thought they had achieved independence. Nothing could be further from the truth. The old British Empire is now controlled by different means. It is called hegemony, and the UK/US/Zion combo are moving towards world government and they will not allow anything to stand in their way. In other words, anything goes, and this includes funding Syrian terrorists, Taliban, and bombing allies such as Pakistan with drones. My sympathies go out to the Pakistan people. The US/UK/Zion combo are creating many problems for them. Did I say anything in support of TTP in any of my comments, ever? The Indian’s ability of writing few lines in English does not make you genius as well. Obviously a number of RW activists will reject the report as one sided, inaccurate & fed by the West. Can we request all those RW parties who are noisy on this issue to share information on those civilians killed in drone attacks? Information on those 50000 Pakistanis killed by TTP is widely available however information on drone attack victims is a mystery. Yup, things are intentionally made complex and confusing, to keep the secrets, secret. No secret agency publicize what operations they are doing, and how. Do they? So, if you are somewhat lost, nothing strange. You’re just one those billions who are supposed not to understand. If terrorists are to be warned before time then what was the need of Drone attacks. The only people that are safe in Pakistan are the ones who are supporting TTP. There is no need for drone attacks. Do not believe the propaganda. The people being killed are mainly innocents. The occasional professional soldier, which you call a terrorist, does get killed, but they are trained to avoid drones. In any event the US is cold-bloodily killing innocent children and even one is too many. Perhaps I am too sentimental, but, in my view, that is preferable to people who are not bothered by children being killed. I neglected to mention in my last missive that a US Stanford University investigation estimated that less than two per cent of drone victims were high level targets. Pilger said of the Bureau’s work on drones: ‘This was extraordinary work on Barack Obama’s lawless use of drones in a campaign of assassination across south Asia. Woods, Ross and Serle stripped away the façade of the secret drone ‘war’, including how it is reported and not reported in the United States: how civilian casualties are covered-up and how rescuers and funerals are targeted. sad to read that those 200 (im suspecting the figure is much higher) children meant nothing at all..poor, poor souls. Pakistani intelligence officials, ‘three Taliban commanders‘ and government officials from the tribal agencies said Haqqani militants were targeted. The Haqqani network carried out cross-border attacks on Nato and Afghan forces and has been targeted several times by the CIA. As the day wore and understanding of the situation grew, the death toll rose. By around 11am local time Reuters and AFP were reporting 17 killed in the strike. There were no reports of any civilians or senior militants dying in the attack though Dawn reported Haqqani ‘head commander Haji Shahrifullah‘ was not killed in the strike.